Our peanut /nut-free facility currently has a production capacity of 150 million bars/year. All our bars are also gluten Free Certified. Yourbarfactory exports it cereal, protein and energy bars worldwide (Unites States, Chile, Korea, Switzerland…) and we are expanding internationally at a rapid pace. No matter where you are located, we would be pleased to create and manufacture your private label bars. At Yourbarfactory, multiculturalism is in our DNA: our 70 employees come from 20 different countries. Created in 2001 under the name of Rapid Snack Inc., the company was then specializing in manufacturing marshmallow squares. 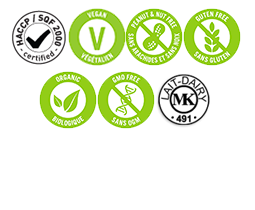 In 2005, the manufacturing of allergen-free products became our priority in order to respond to the high increase in food allergies. The factory became peanut-free and nut-free and also became kosher certified. In 2007, Rapid Snack Inc. diversified its products by offering customized cereal and fruit bars for private label. In 2010, Rapid Snack Inc. became Yourbarfactory in order to better represent the evolution of our business: the creation and manufacturing of private label customized bars. Today, Yourbarfactory continues to grow with a new facility under construction which will allow us to double our production capacity by 2020. These 5 values combined with our innovative HR policy promoting happiness at work (continuous training, French classes, social activities, fitness room…) allow us to create an harmonious working environment in which everyone can develop their respective talents.